Making 3D printing instantly a lot more interesting/potentially terrifying is a new system that lets you ‘print’ conductive circuitry. The university students behind it have printed a playable game controller from scratch as a proof of concept. 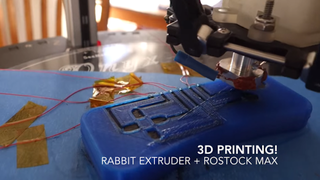 The Rabbit Proto is an additional print head designed by the Stanford University students to fit on to a number of RepRap model printers. It enables them to introduce conductive material with the normal plastic during the printing process. Currently it uses silver-filled silicone (fancy) but the team are working with a company to use the more cost-effective graphite paste. The clock is now ticking until the first printable robot.